The first time I ever spoke with Carine McCandless was in October 1992. 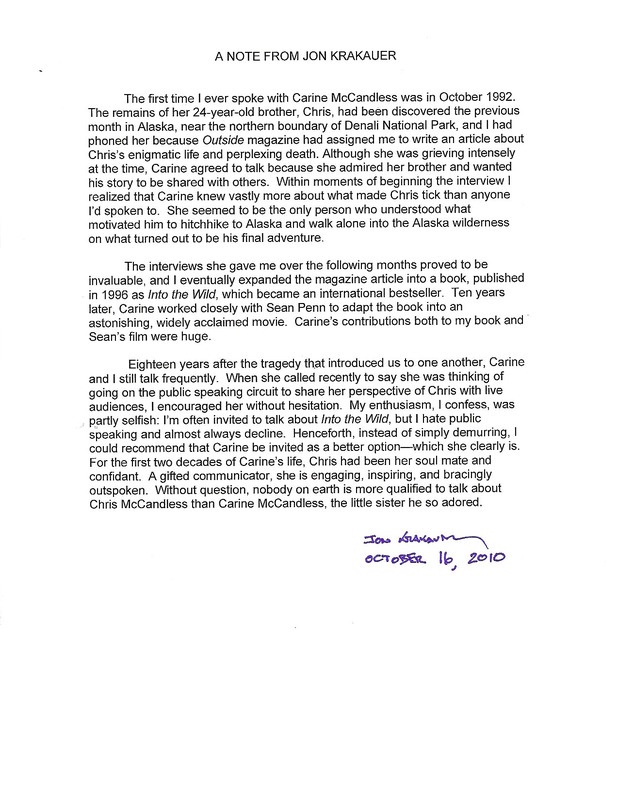 The remains of her 24-year-old brother, Chris, had been discovered the previous month in Alaska, near the northern boundary of Denali National Park, and I had phoned her because Outside magazine had assigned me to write an article about Chris’s enigmatic life and perplexing death. Although she was grieving intensely at the time, Carine agreed to talk because she admired her brother and wanted his story to be shared with others. Within moments of beginning the interview I realized that Carine knew vastly more about what made Chris tick than anyone I had spoken to. She seemed to be the only person who understood what motivated him to hitchhike to Alaska and walk alone into the Alaska wilderness on what turned out to be his final adventure. The interviews she gave me over the following months proved to be invaluable, and I eventually expanded the magazine article into a book, published in 1996 as Into the Wild, which became an international bestseller. Ten years later, Carine worked closely with Sean Penn to adapt the book into an astonishing, widely acclaimed movie. Carine’s contributions both to my book and Sean’s film were huge. Eighteen years after the tragedy that introduced us to one another, Carine and I still talk frequently. When she called recently to say she was thinking of going on the public speaking circuit to share her perspective of Chris with live audiences, I encouraged her without hesitation. 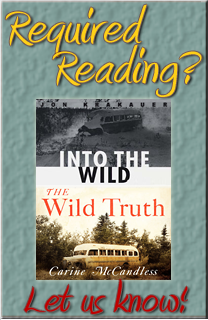 My enthusiasm, I confess, was partly selfish: I’m often invited to talk about Into the Wild, but I hate public speaking and almost always decline. Henceforth, instead of simply demurring, I could recommend that Carine be invited as a better option-which she clearly is. For the first two decadess of Carine’s life, Chris had been her soul mate and confidant. A gifted communicator, she is engaging, inspiring, and bracingly outspoken. Without question, nobody on earth is more qualified to talk about Chris McCandless than Carine McCandless, the little sister he so adored.